Courtesy of the Corney & Barrow Burgundy 2007 tasting. 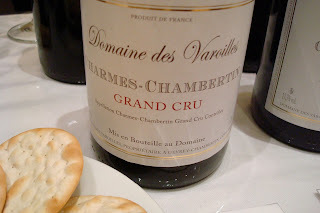 This Charmes-Chambertin, one of the bigger and better Gevrey grands crus, further enhances my view of the Domaines des Varoilles. Initial aromas of pheasant and egg-yolk coated oven-baked pate de pâté launch the wine-inhaler into thoughts of a great future for this wine. Incredible layers of plum and cherry fruit mixed with a butteryness that rounds off the sensations with a sense of luxury. Excellent length in the mouth and concentration but not over the top or "hot" on the finish. Chapeau!